Grades 8-10. 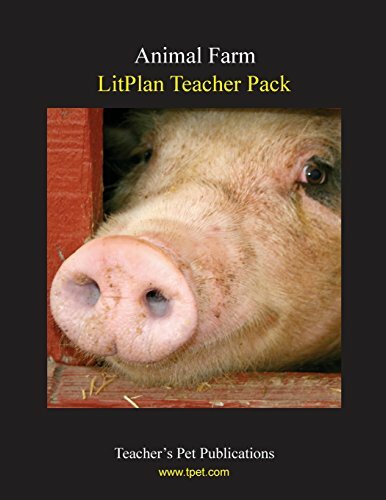 Essentially a complete teacher's manual for the novel, this LitPlan Teacher Pack includes lesson plans and reproducible resource materials for Animal Farm. There is a large group activity in which students pretend they, as a whole class, are stranded in the mountains for one year. Their assignment is to devise a plan for their own survival for the year, including their plans for the structure of their community and an explanation of possible problems and solutions. There are three writing assignments in this unit, each with the purpose of informing, persuading, or expressing personal opinions. The detailed writing assignment sheets guide students through the assignments. The first assignment is to give students the opportunity to express their personal opinions: students write a composition in which they set forth the seven commandments they think are appropriate for our society. The second assignment is to inform: students write compositions in which they answer one of the Extra Discussion Questions/Writing Assignments. They begin this assignment in the library because answering some of the questions may require a bit of research. The third assignment is to write a persuasive composition: students pretend they are Snowball and create a complete plan for replacing Napoleon. These materials are geared for whole class use but are very easily adapted for independent study work, lit circles or book groups, home school use, or tutoring. If you have taught this book before, you might like to know that many veteran teachers have told us they have found our LitPlan Teacher Pack manuals to be much more thorough and more helpful than other materials they have used. All publications are copyrighted materials, with permission to print materials as needed for ONE teacher's classroom use only, unless otherwise specifically stated. Documents may not be reproduced, displayed, or distributed in any other way without written permission from Teacher's Pet Publications. Published by Teacher's Pet Publications, Inc.